If you are facing an Employment Tax Audit from the Internal Revenue Service (IRS) then you should be prepared to provide information regarding your state employment tax obligations. The California Unemployment Insurance Code (CUIC) and the Government Code authorize the Employment Development Department (EDD) to conduct payroll tax audits of businesses operating in California. The audit ensures that benefit coverage is provided for workers who are entitled to such coverage under the law. Typically, the EDD audit will start with an entrance interview explaining the purpose of the audit and gather general information. It is a great time to ask questions and understand the process so you know what you are facing. They may request accounting records from the last three years. By reviewing your books and records, the goal is to verify business ownership, proper classification of employees, and reports of gross/taxable wages. Keep in mind that the CUIC requires employers to keep payroll records that are updated regularly and checked for accuracy. It should account for all workers (employed, laid off, on a leave of absence, or an independent contractor) and all payments made. The type of system you use should meet the needs of your business and EDD requirements. Once they’ve reviewed initial documents and all additional information that may have been requested by the auditor – they will conduct an exit interview to discuss findings. Results may include a no change audit (in which no differences are found), an overpayment (a credit or refund may be issued), an underpayment (differences will be assessed) or both over- and under-payment. In order to appeal – you must submit a petition for a hearing before an Administrative Law Judge. We tried to breakdown and simplify the process for you, but it is much easier with a tax professional by your side. IRS Audit Group of Beverly Hills is eager to be your designated representative during this time. We can communicate with the IRS on your behalf and reduce the stress that comes along with an audit. While the process is nerve wrecking, it can be made a breeze if you have all documents sorted and ready at all times. IRS Audit Group can assist with all of you tax needs, from filing to facing a tax audit. 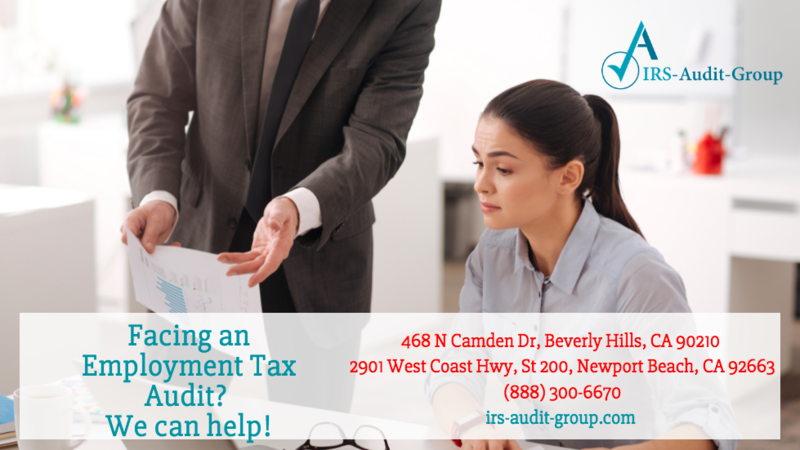 Give us a call to learn more and check out IRS Audit Group Newport Beach as well!